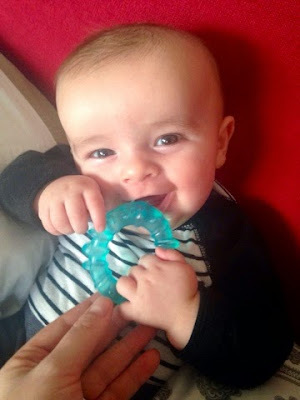 It's been quite a week for little Grahamlet - not only did we move to a brand new apartment where he's got his very OWN bedroom (which he's probably totally ready for, but his wussy mom is a little apprehensive about), he's also been working on tons of new bebeh skills! 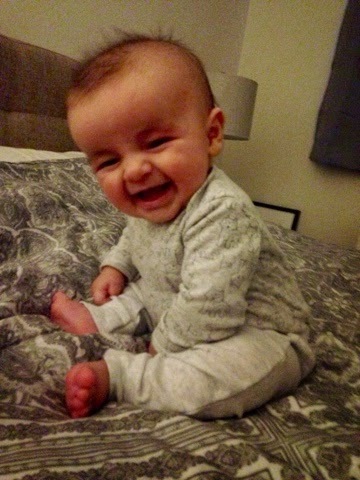 Balance has vastly improved as he experiments with sitting on his own. 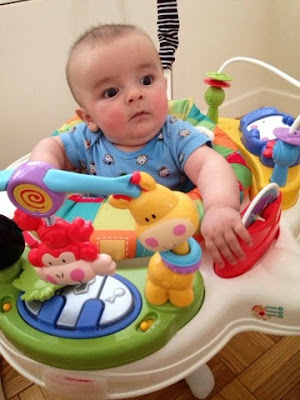 He of course can't get himself into the sitting position yet, but when we place him next to us on the couch or bed he is usually able to stay somewhat upright, leaning forward and side to side, eagerly experimenting with gravity and his center of balance. Propped up with a pillow, he'll often lean away from it and see just how far he can go on his own. Exciting to see, but also means we need to keep a very close eye on him so he doesn't tumble off the edge. Hand eye coordination is getting really great. 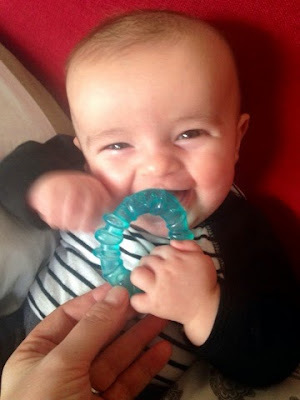 He's starting to grab for toys and sometimes even manages to keep hold of them for a few minutes. When we hold him, he'll often grab onto the collars or sleeves of our clothes, my glasses or sometimes even my hair and boy is his grip vice-like. 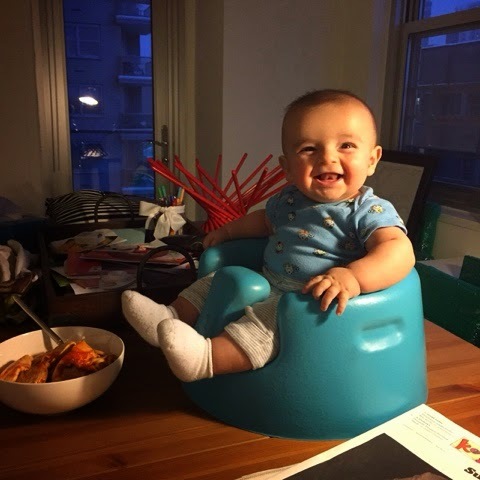 He just got a jumping seat when we moved into the new place (the joys of a larger living space – more baby crap!) 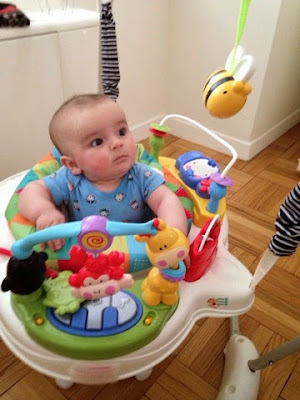 and is mesmerized by the toys he can touch, spin and move as well as the dangling ones. He's also good about letting us know when sensory overload is imminent and let's out a screech to advise he needs some peace and quiet. We left the toys off one side, so we can spin him that direction and he can just bounce around without having a bunch of stuff in his face. Also those were the toys that made noise, no thank you! 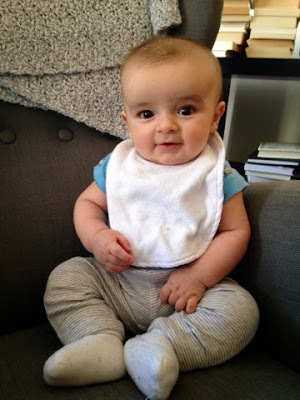 This kid weighs a ton and I'll be eager to see how much he's grown at his four month doctor visit (this Friday). 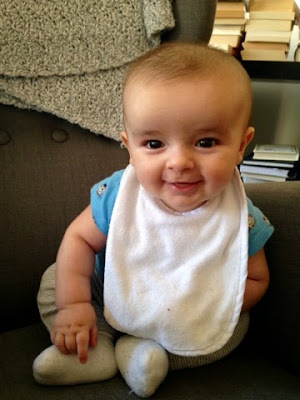 When he's well rested, he's such a bright, cheerful kid. The battle is just keeping him (and us) well-rested. *sigh* And what a battle it is. That smile though. Gets me every time.